A sports equipment bag assembly to be used for baseball & softball bats. Having a removable bag enclosure for heating bats using sunlight. The removable bag enclosure has a transparent outer panel and a solar reflective inner panel. The reflective surface both insulates and reflects the solar light to heat the bats. The removable bag enclosure is removably fastened to a larger bag assembly by a fastener such as a zipper. The removable bag enclosure and the larger bag assembly have hooks that enable them to be hung upon a fence or similar structure. The sports equipment bag assembly further provides a shoulder strap to facilitate carrying. This heater bag, as stated, can be attached to an existing bat bag, or equipment bag, or used independently. It is designed to heat from 1-12 bats simultaneously. Helps bats from breaking, cracking, stinging hands. Can be folded for easy transport. I've been using mine for approx. 3 yrs. Selling them by word of mouth & on E-bay. Web site is, heatmybat.com. Am wanting to sell patent, with royalties package, thanks for looking. 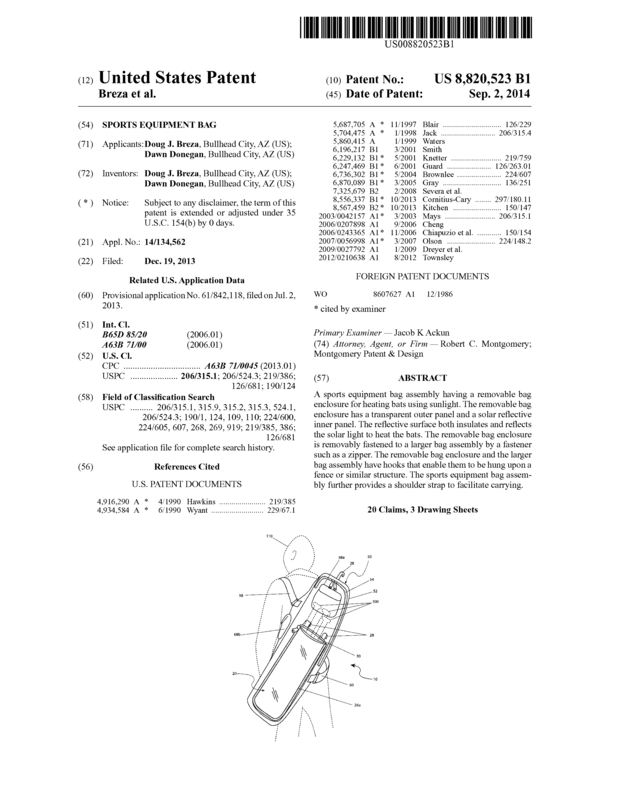 Page created at 2019-04-25 0:36:32, Patent Auction Time.